I consider this a must read for any student of cast bullets. "But wait," you say, "I'm not shooting a Paradox gun, so this doesn't concern me." But all revolver bullets must take a flying leap before they slam into the rifling, similar to a Paradox gun. And some rifles have a long freebore that requires bullets to take a flying leap to reach the rifling. What if the forces on those bullets are similar to a Paradox gun? From the November 1997 Guns & Ammo, by Ross Seyfried. "The Amazing Paradox Revolver." I looked around on the Guns&Ammo website, but could not find a back issue of November 1997 for sale? 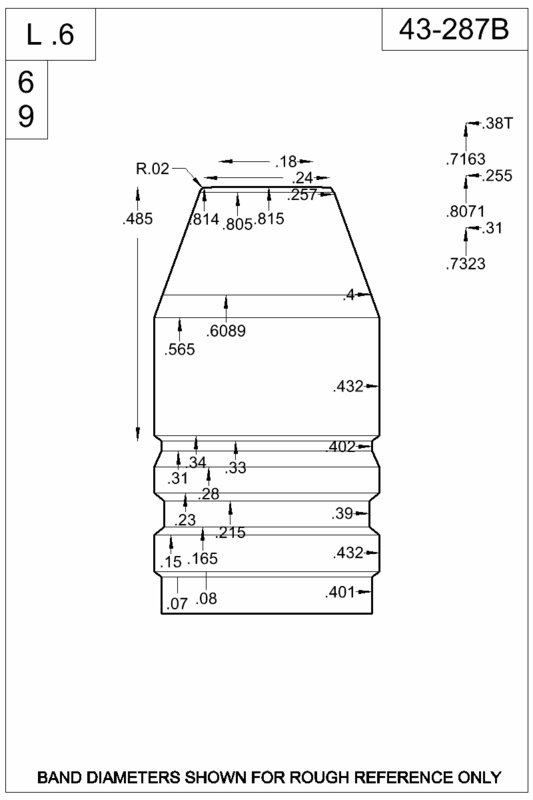 I got a report on what may be the "Paradox effect" in a 44 mag, using what appears to be Accurate Molds #43-287B. Note that bullet's unusually long front band. Our intuition wants us to believe that a long front band will help grab the rifling, but the Paradox effect tells us that lead displaced by the rifling will have no place to go, and the bullet will get squeezed like a tube of toothpaste. Deets at this link. I don't think he is going to find a solution with that particular bullet -- it's a flawed design. It might shoot better in a rifle where it didn't have to slam into the rifling. That bullet is giving consistent 4.5-6" groups at 100 from a Super Redhawk off the bench. Lots more testing to be done to see what can be done to make it shoot. At this point I view it as a test bed to explore the Paradox effect. I have already tried a few hollowpointed and some with grooves cut into the nose. The nose grooves show some promise which makes sense based on reading the article on the Paradox effect. Thanks for your input Dan. This is more educational than I ever expected. All I wanted to do was shoot smaller groups at 100 with a revolver. Brad wrote: That bullet is giving consistent 4.5-6" groups at 100 from a Super Redhawk off the bench. How does that compare to other bullets? 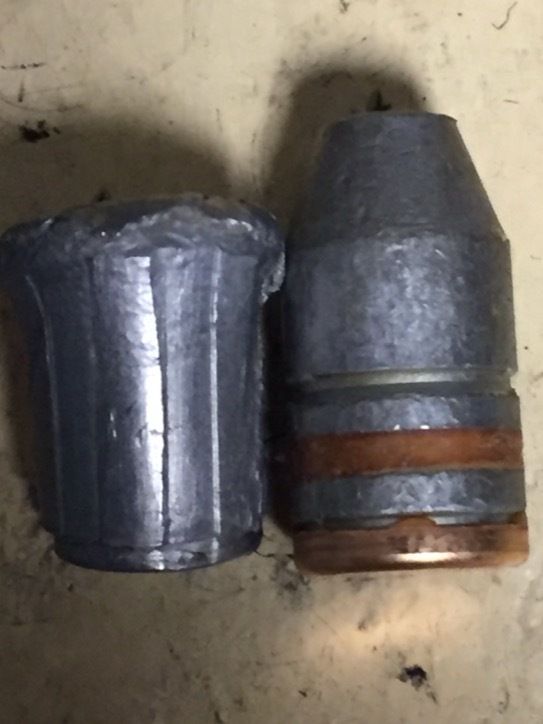 I did better, about 2.5", with a 305 gr HP from MP moulds. It showed far less deformation but it also had a much deeper angle sided grease groove. It also had a much longer check shank. I have a few other bullets I want to try in time. What threw me most was the lead on the sides of the check. The MP mould never showed that. Posted more results from firing. Starting to really look like my biggest issue is having .432 throats and a .429 bore. Squeezing a bullet down .003 does bad things to the bullet, even worse with this design. Thanks for the update. You do good work, Brad. In the next few days I hope to cut an experimental mold for my 357 revolver and fire it into the water tank, to see if it reduces deformation.